Not to mention a guide to each diet and their symptoms. In addition to all of this, the book was written, photographed, designed and illustrated entirely by restaurant staff! I know that the recipes are good, I indulge in them regularly at the mothership (can soup get better than the soup from Cornucopia?!). I also have a few friends with the book who have made them (and served them to my mouth-watering delight) and last weekend the wonderful 'F' and I collected all of the required ingredients from the Organic market in the Dublin Co-op and proceeded to dance and sing our way through the Leek, Spinach and Lentil Nut Roast and for dessert made the Blueberry and Almond squares (photographed above - although mine are made with spelt & rice flour)… During the collection process I was cringing at the growing price tot but was very happy to note that I now have dinner for a week!! I love when things average out on the tasty side. But not to worry – it cost a bit above average because we chose a 'nut' roast with no less than 6 leeks and a blueberry, date and almond based dessert, none of which are the cheapest to ingredients on the market! … But don't let that put you off because there are a load of recipes with a nice range of ingredients (and prices) and always remember, you’re not just cooking for one day so it’s actually more of an investment in your week! I've been checking out some different ways of keeping on top of my swirling web of internet life.. There is bloglovin' which is a nice tidy little site to view everything from... Google Reader is also cool with a great 'recommended' section based on my little library of blogs and then FriendConnect has that great option of knowing your readers better, and of course there is twitter - the realtime guide! Ok, sweets are sweets. There are healthier ones and there are ones filled with e-numbers. There are sweets laced with fat, laced with sugar or worse still, laced with artificial sweeteners. There are also sweets which are free from common food allergens and likewise, ones which are not. Just because something is 'food allergy friendly' does not mean that it’s going to be ‘good’ for you … but I’m sure that you’ve already discovered this minor fact in your food allergy travels! I like a quote I found in the Irish Independent from Cork based vegan baker, Paula Larkin (Sugar Moon): “Being vegan is no different to any other form of diet – you can choose to be healthy or you can choose not to be. I can be vegan and spend my days eating chips, bread, pasta and meat replacements, or I can be vegan and eat fresh vegetables, pulses, nuts and wholegrains.” This is obviously relevant to food allergy free diets too!! These cookies are a crispy (not gooey) full sized biscuit. They are quite sweet and ideal for dipping in tea or coffee. The price (approx. €2.25 – €2.50) for a pack of 10 keeps them affordable and the substantial list of food allergens which they are free from makes them convenient for many. Available in many gourmet grocers. Definitely available in Nolan’s Food Fare in Terenure. Note: they do contain potato, corn, nuts, palm oil and refined sugar. This is my new favourite Nakd bar. 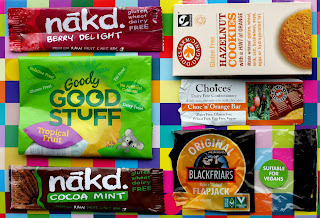 It’s the same deal as with the rest of the nakd bars but for some reason I really like this one above the others. When I smell it and bite into it I think ‘yum! Mint chocolate.. oh wait, no, it’s nutty goodness..’ and then I go right back to ‘yum mint chocolate!’ But it’s so simple. And I love the ‘nutty goodness’ flavour too. They are small but filling so the €1.50 price is quite reasonable! Available in most health food stores. Nakd is also appearing in larger supermarkets too so keep an eye out. Another new snack bar from Nakd. It is a bit sweeter than the rest in my opinion and generally more ‘dessert’ like in taste. Somehow it oddly tastes a bit more ‘oaty’ or something despite there being not an oat in sight! Nakd is coming up with all sorts of sugar free snacks which is great. Approx. €1.50. Available in most health food stores. Nakd is also appearing in larger supermarkets too so keep an eye out. Note: although I say that they are sugar free there is obviously naturally occurring sugar in the ingredients. Blackfriars Original Flapjacks are a guilty pleasure. They are not low in sugar and they are definitely not low in fat but when I’m truly stuck for something quick and filling I can find these flapjacks. The benefits are that they can be found in many corner stores and are less than €2 in price. And it’s so hard to find a dairy free flapjack! Although not complicated in flavor they are the original and usually find their way into my diet when I am late for work but starving so I have to make do with my local Centra or Londis to tame the beast that is my growling tummy! Also available in most Holland & Barrett stores. Note: Although not containing nuts there is a warning on the package which states that it is ‘produced in a nut environment’. Also, there are a whole range of flavours but all are not vegan so beware. You may remember my ravings a few months back in relation to ‘Choices’ Caramel Chocolates’. They are the bees the knees. Likewise, these plain bars are good too. It is a bit creamier than the regular dairy free chocolates on offer which is helpful if you are not a fan of dark chocolate however the Choc ‘n’ Orange bar is still a ‘hard’ chocolate but it’s a good substitute if you are soya free along with everything else. Not hugely available yet but can be found in some health food stores like Restore on Lower Camden St. Note: The oddity is that the packaging states that they use ‘secret Choices flavourings’ which don’t appear on the ingredients list so we can only assume that they are soya free as it is not outwardly advertised. Ok, jellies are jellies. I think that jelly lovers everywhere have their own opinion of a nice jelly. I like a specific type of flavour and a specific level of softness. I can also like my jellies stale and hard if they are more like wine gums - don’t ask! But my point is that I can’t guide you on flavour here. Goody Good Stuff’s jellies have a different variety of flavours than what I am used to but they are jellies and they are food allergy friendly AND gelatin free. Available in Health Matters on Grafton St. Note: although, these jellies are gelatin free, they are not vegan – see the list of ingredients below. Ingredients: Gluten free flour blend (brown rice, potato, maize), sugar, palm oil, hazelnuts 9.7%, orange paste (corn syrup, sugar, orange peel 1.1%, concentrated lemon juice) rice malt, lemon oil, raising agent (sodium bicarbonate). Ingredients: Glucose syrup, sugar, gelling agent; gellan, carrageen; acidulant: citric acid; acidity regulator: trisodium citrate; flavours; concentrates of fruits and plants (orange, elderberry, lemon, aronia, black currant, apple, kiwi, spinach, nettle); vegetable oil; glazing agent: yellow beeswax, carnauba wax, elderberry extract; fructose; invert sugar syrup. If you're living in Dublin and are vegan, or simply dairy free or egg free there is absolutely no need for you to go through a sweet-less existence! 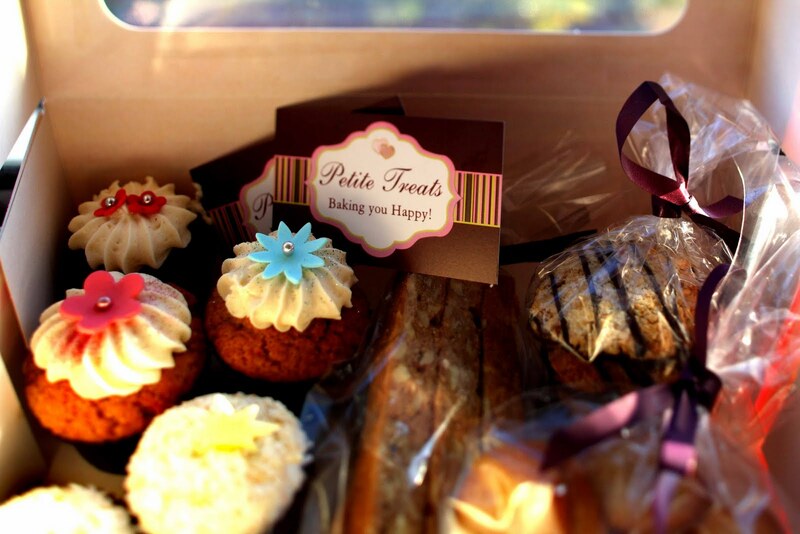 I recently took indulgent delight in a selection of Dublin’s ‘Petite Treats’ vegan baked goods. I cannot express how ‘yum’ these treats are! In addition to the above they can also cater for specific food allergies such as gluten, wheat, soy and corn upon request. The extra great thing about Petite Treats is that everything is made to order so freshness goes without saying, and there will be no doubt in your mind about that when you taste how moist the cupcakes are and how fluffy and soft (and completely delicious) the ‘cream cheese’ icing is! The cupcakes are decorated with glittery sprinkles and handmade sugar decorations. They are beautifully presented in bright and cheerful striped delivery boxes (which make you feel like its summer the minute you see them!) and the biscuits come in clear plastic bags tied with ribbon, making fantastic gift ideas for tea at a friend’s house, a present for a special occasion or a simple thank you package if you are being generous, that is, and not just hoarding them for pure selfish delight! I think that once you try a few of the treats on offer you will be hard pressed to choose a favourite. I am presently dithering between the Toasted Coconut cupcakes with Coconut ‘Cream Cheese’ frosting, the Belgian Dark Chocolate cupcakes with ‘Cream Cheese’ frosting and the Anise and Almond Biscotti…if I can ever decide I will let you know! When I recieved my food intolerance test results back from York Test I was forced to invent new meals which were food-allergy friendly according to my new restrictive diet. This sweet potato and prawn dish is a quick and spicy main course that you can throw together in a pinch. I usually use frozen pre-cooked King prawns from Lidl which are great value and keep the fear of food poisioning at bay if you are unfamiliar with shellfish - be sure to get the ones without the seasoning which contain some common food allergens. And if you don't like too much spice reduce the amount of ground ginger. 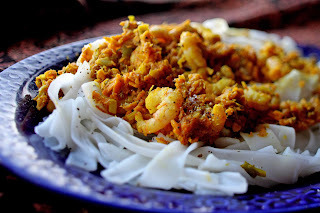 I like to serve it on a bed of thick flat rice noodles. I get them from the Asia Market on Drury St in town (Dublin 2). Be careful to read the ingredients and get a brand which does not add regular 'flour' to the mix. So please, give it a go, change it around, add some of your own food-allergy friendly ingredients and let me know how you get on! ... making a new dietary life is always a work in progress! Heat the oil in a large pan at a moderate heat. Add the leek and garlic and gently fry until soft, but not brown. Add the sweet potato and thyme. Stir periodically to encourage even cooking for 6-8 minutes or until the sweet potato is evenly cooked (the potato will soften and the colour will become a brightened orange/yellow). You might add an additional 1-2 tbls of oil if desired. Stir in the quinoa flour, millet flour, ginger and turmeric. Add the water (or coconut milk if desired. Cook a further 3-4minutes (or until the texture is thick but creamy if using coconut milk). Add the prawns and cook until fully defrosted and warmed (adding the lemon juice once the prawns are almost completely defrosted. Serve on a bed of flat rice noodles. 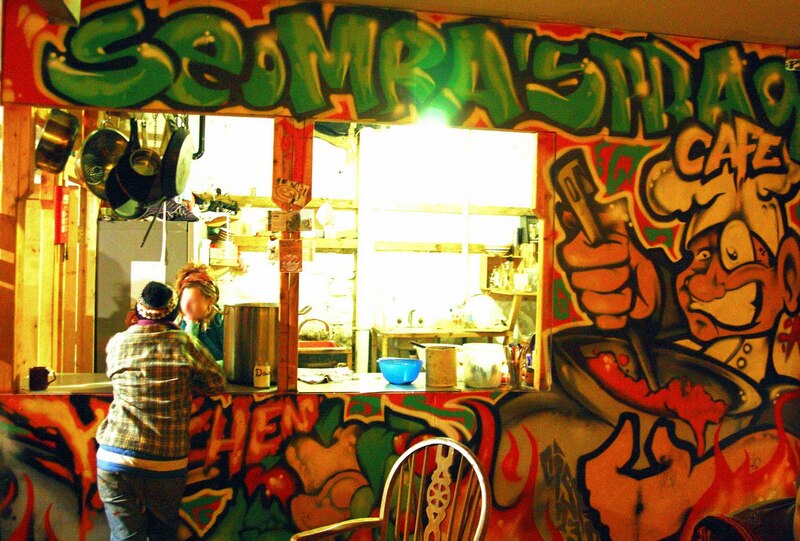 Every Wednesday evening from 7:30pm to 8:30pm (open until 10pm) you can get a filling quality vegan meal for a donation of €5.00 (more/less according to what you can afford) in Dublin's Seomra Spraoi. That of course means dairy free, egg free and meat free all in an anti-capitalist, non-hierarchical, not-for-profit venue! 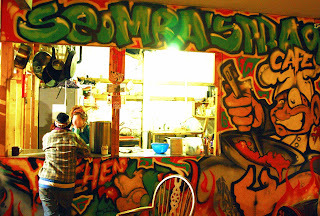 Seomra Spraoi is an 'autonomous social centre' and offers a wide variety of services and social interaction including Spanish classes, bike workshops, political meetings, gigs, film screenings and of course, the wednesday night café. They even have a 'free shop' on the upper level and a room to store your bike in safely while you are there! The set up is this: The entire centre is run by volunteers with no 'boss' as such. Once you find the location down a side street off Upper Gardiner St (or under an arch off Belevedere Pl) in Dublin 1 you can put your bike away, head in towards the back of the building, make your €5.00 donation & line up for whatever vegan delight is awaiting you. There's not really much room for picking and choosing as you sort of get what's on offer that day. Last week I got a plate piled high of couscous, a tofu & lentil gravy, fresh salad with olives and salad dressing. It tasted great and was perfectly rich and hearty for a winters evening. Then take a seat wherever you can find one, give it a moment and you will soon be chatting away with your neighbours about anything at all. First of all I would like to wish you every happiness of 2011. My christmas was great and the food-allergy free delights which filled my house were top notch as usual thanks to my maternal holiday chef! However, all those sweets and rich foods (food-allergy friendly or not) are only desirable for a short while and no matter what I do I always seem to come into January looking forward to a simpler life. But one last hurrah is always needed and we certainly got it in deluxe this time round! It's hard to feed everyone that you would like to ring the new year in with so this year I took part in a Potluck. Potlucks are a very common-place event in North American circles. The idea is that each guest brings a dish of their choosing and all share the different foods. It's great for variety, ideas and expense but can become problematic for people with food allergies. The purpose of this week's log however is to celebrate! The food-world is changing and food-allergy awareness is growing rapidly! At the last potluck 2010 we had 14 dishes and all except two were dairy free and vegetarian!! The extra amazing thing was that only two of those items were substituted from their original recipes! All guests knew that there would be a couple vegetarians and a handful of dairy free attendees but I am still shocked at the outcome. I have often attended such events in the past and was forced to pick at my own dish to avoid my food allergy evils, but it seems that food allergy-friendly recipes are becoming more and more available and the quality is trumps- Hark the Herald! As you can see the variety was great and it just goes to show that eating and entertaining around your own and/or your friends' food allergies is easier than you might think . And remember kids: Just because it's Food-Allergy Free doesn't mean that it won't taste AMAZING!